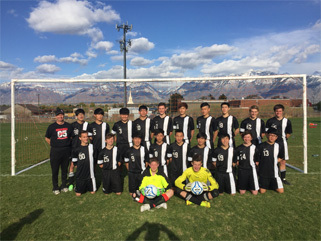 Middle and upper school students can participate in a variety of sports at American Heritage of South Jordan, both during and after school. The programs include competitive and non-competitive sports. Tryouts are held in the spring and again in late summer/early fall for the competition basketball team. The AHSJ Eagles practice and play during the months of December–February. Students not wishing to play competitively may also learn the rules of the game and play in a more relaxed environment in the physical education classes. Soccer has been a popular sport at American Heritage for a number of years, due in part to some amazing Korean international students. These students created their own team and designed uniforms before the school had an official team. We now have a competitive team with tryouts being held in spring. Soccer is also part of our physical education program where middle and upper school students can participate. Volleyball is currently offered competitively and as a sport within the physical education program. Students are taught the rules of the game and given opportunities to play against others within the class setting. Both boys and girls also have competitive teams. Dance at American Heritage provides students with the opportunity to acquire proficiency in dance regardless of previous training or background. Daily class options include hip hop and contemporary, with varying class levels. The classes are open to students in grades six through twelve. More advanced students may audition for the hip hop, ballroom, and Alliance companies. All dance students are expected to perform twice each year. 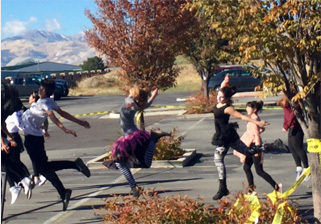 First, the students perform “Thriller” at the annual harvest celebration in the school parking lot. Classes also perform at the end-of-the-year recital.